The Pursuit of Holiness by Jerry Bridges is an inspiring book that looks at holiness which is a tremendous challenge and an awesome reminder of God's desire for His children to walk in light of His word. 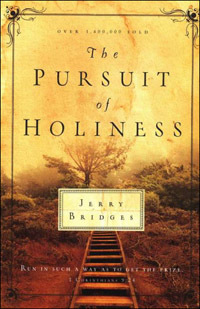 If you want a fresh challenge to holiness, then I would encourage you to purchase and read this book by Jerry Bridges. Here are some quotes from the book that may inspire you to read this classic. "The shrill ring of the telephone shattered the stillness of the beautiful, crisp Colorado morning. On the other end was one of those utterly impossible individuals God seems to have sprinkled around here on earth to test the grace and patience of His children." "He was in top form that morning - arrogant, impatient, demanding. I hung up the phone seething inside with anger, resentment, and perhaps even hatred. Grabbing my jacket, I walked outinto the cold air to try to regain my composure. The quietness of my soul, so carefully cultivated in my quiet time with that morning, had been ripped into shreds and replaced with a volatile, steaming emotional volcano." "As my emotions subsided, my anger turned to utter discouragement. It was only 8:30 in the morning and my day was ruined. Not only was I discouraged, I was confused. Only tow house before, I had read Paul's emphatice declaration, 'For sin shall not be your master, because you are not under law, but under grace.' But despite this nice-sounding promise of victory over sin, there I was locked in the vise-like grip of anger and resentment." "'Does the Bible really have any ansers for real life?' I asked myself that morning. With all my heart I desired to live an obedient, holy life; yet there I was utterly defeated by one phone call" (Quote from pages 13 - 14). "Are we willing to call sin 'sin' not because it is big or little, but because God's law forbids it? We cannot categorize sin if wer are to live a life of holiness. God will not let us get away with that kind of attitude" (Quote from page 19). "In the deceitfulness of our hearts, we sometimes play with temptation by entertaining the thought that we can always confess and later ask forgiveness. Such thinking is exceedingly dangerous. God's judgment is without partiality. He never overlooks our sin. He never decides not to bother since the sin is only s small one. No, God hates sin intensely whenever and wherever He finds it" (Quote from page 29). "Paul said, 'For the grace of God that brings salvation has appeared to all men. It teaches us to say 'No' to ungodliness and worldly passions, and to live self-controlled, upright and godly lives in this present age" (Titus 2:11-12). The same grace that brings salvation teaches us to renounce ungodly living. We cannot receive half of God's grace. If we have experienced it at all, we will experience not only forgiveness of our sins but also freedom from sin's dominion" (Quote from page 34). "God does not require a perfect, sinless life to have fellowship with Him, but He does require that we be serious about holiness, that we grieve over sin in our lives instead of justifying it. and that we earnestly pursue holiness as a way of life" (Quote from pages 35 - 36). "The One who makes our service effective and who empowers us for service is the Holy Spirit. Note well that He is called the Holy Spirit, or the Spirit of Holiness. When we indulge our sunful natures and dwell in unholiness, the Spirit of God is grieved (Ephesians 4:30) and will not prosper our service. These are not times when we fall into temptation and immediately seek God's forgiveness and cleansing, but lives that are caharacterized by unholy living" (Quote from page 37).